In the ancient past, the Riviera Maya on Mexico's Caribbean coast served as the jumping-off point for divers bound for Cancun. The perfect amalgamation of the famous Caribbean reef diving and intriguing cenotes – Riviera Maya has something for every traveler. The unique aspect of Riviera Maya scuba diving is fully manifested in the omnipresent cenotes - sinkholes formed by collapsing underground caves. The great thing about scuba diving in Riviera Maya is that there is such an amazing variety of dive sites and cool things to see. From the largest barrier reef in the Western Hemisphere to shipwrecks, and even an underwater museum, there is no shortage of amazing options for scuba divers and snorkelers. The increasingly popular places to snorkel or dive on the Yucatán Peninsula is in the cenotes of the Riviera Maya. The cenotes in the Riviera Maya are sinkholes that open into a really extensive subterranean river system in the Yucatan Peninsula (Mexico), thus leading to the formation of large underwater cave and cavern systems. Divers from across the world come here to dive in these splendid amazing caves. If you are not certified, you can enjoy snorkeling in the cavern area under the supervision of a qualified instructor/cave diver. Everything you see in the cenotes is magical! To see the amazing formations of the ancient stalactites, stalagmites & the gigantic columns, you need to experience the weird visual effect caused by the halocline (blurry effect). Enjoy the amazing colors when the sunlight penetrates the water and through the fossils that are millions of years old. In actual terms, it is a natural museum. This place was considered sacred by the ancient Mayan civilization. The Mayans believed these “holes” were the passage to the underworld, where different gods lived. Diving in the cenotes offers a spectacular experience. You will be immersed in this magical environment which feels completely like a different world. The water is so unbelievably clear that you feel like you are flying there, that there is no water around you, that you are floating in the air while admiring the beauty of this mysterious place. You just have to see it!! The visibility in the cenotes is so very clear that you can enjoy the spectacular views. However, you need to keep control of your buoyancy or kicking style. If in case you hit the bottom, it can make sediment particles rise and remain suspended in the water thus worsening the views of the divers. The reason for this phenomenon is easy to explain: it is due to the limestone of which they are composed. Ik Il cenote – A visit here is often included on tours to Chitzen Itza. The water surface with a diameter of 200ft is so deep, that no one has ever hit their head on the bottom and diving here is an altogether amazing experience. A circular staircase has been carved out of the limestone, which makes for an easy walk down to the water. Dos Ojos Cenote – Dos Ojos consists of two connected sinkholes with a large cavern between them. If you are in the Riviera Maya for scuba diving, then enter the 2nd Cenote for a spectacular experience. Ponderosa El Eden – Ponderosa El Eden is popular as it has a large island in the center of it. Climb up the large tree in the middle of this island and jump into the water. Enjoy unlimited visibility under the water, and a wide variety of fish, eels, turtles and plant life. Chaak Tun – Here the cave opens to a small courtyard with tall trees that rise into the jungle and with a variety of birds singing and making different sounds. While diving, keep your eyes peeled for a stone replica of the famous Virgin of Guadeloupe at the bottom of the Cenote. All of the cenotes are really different and offer a unique and varied experience to the divers. 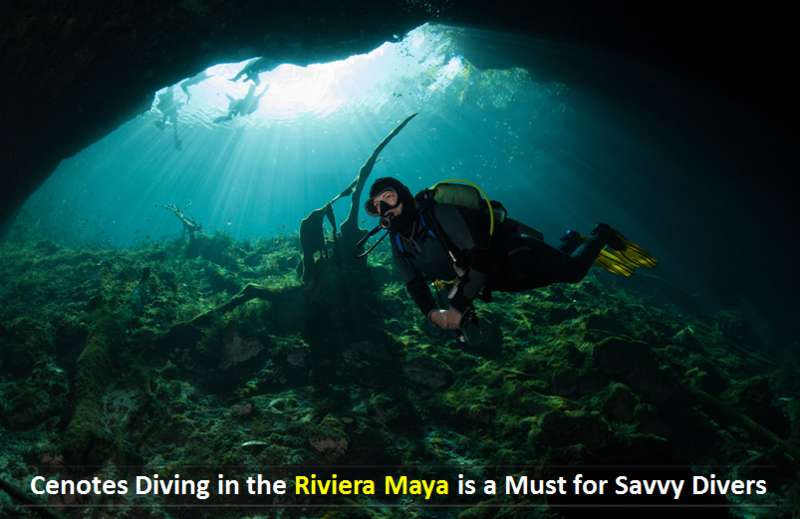 Riviera Maya scuba diving lets the divers witness the magical underground world, thereby leaving them awestruck in the last!